Decided to bottle after two days of little to no sign of fermentation. Very curious to see how this beer will taste, especially given how bitter and largely un-sweet the wort initially tasted. (To be honest, I was more than a little worried that this beer would turn out too bitter and too dry.) The beer has darkened considerably, and cleared slightly. Just a few quick notes on the fermentation process: Since first brewing, I decided to keep the fermentor upstairs given how cold our basement has gotten since mid-November. I wanted to be sure that the temperature stayed above 65 'F at the very least. During the winter, it may not be possible for me to store fermenting beer in the basement. Instead, I kept it covered and in our back room -- the warmest room in the house (~68 'F). This was also the first time I decided to make use of a blow-off hose (instead of just attaching the fermentation lock at the outset). I fit one end of the hose into the carboy's opening and the other in a small jar of water. This basically created a large lock. After a day or two I attached the official lock. Don't think this will have much of an impact, but it was nice to not worry about an overflow clogging the lock. I sanitized my secondary fermentor, bottles, caps, auto siphon, hose, funnel, etc in One-Step Sanitizer. (1 T per 1 gal of water). This is a drawn-out process with 48+ bottles to sanitize plus equipment. Is there a quicker way? Perhaps I should just clean all bottles BEFORE beginning bottling. Maybe next time. I got the priming sugar ready (1 ¼ c Briess Dried Malt Extract boiled in 16 oz water for 5 min) and added it to about 1 gal of beer siphoned from my primary fermentor to my secondary fermentor before siphoning the rest. I do this to cushion the glass from the boiling hot liquid, while getting a decent mix of the priming sugar with beer for bottling. From there it was just a matter of filling each bottle while Jenny capped. Siphoning took FOREVER. It only took 2.5 hours; which is about 1.5 hours longer than it should have taken. I'm not sure why it was so difficult. Density of liquid? Not only that, but because we had to keep pumping the siphon, it created a fair amount of air bubbles throughout the process. I'm hoping this doesn't mess with the carbonation of the beers. It made me want to go out and get a bucket with nozzle to just twist on and off to fill each bottle. Xmas gift? Color: Looks like apple cider, auburn gold, slightly cloudy. Taste: Full, nice hop bitterness, faintly sweet, ruddy complexion, apple, lemon, fairly refreshing. Overall, a seemingly successful (if somewhat stressful) brew. Can't wait to try it! Just 10 more days. This American Pale Ale marks my first true foray into crafting a recipe of my own. 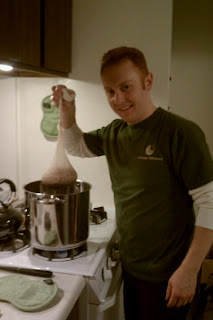 I based it on the American Pale Ale outline in "The Complete Joy of Home Brewing, 3rd Ed." Roast pale ale malt and Munich malt in oven at 350 'F for 10 min. Combine with Melanoidan malt and steep (in bag) in 1.5 gal cold water. Bring to 160 'F for 30 min. 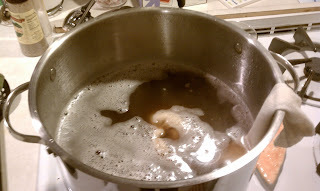 Add light and amber malt extract syrup. 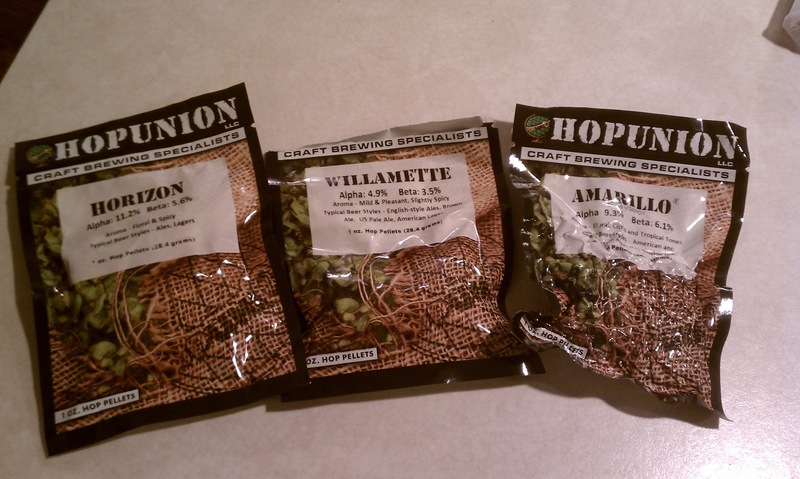 Add Willamette and Horizon hops. Boil for 60 min. Add ½ oz Amarillo during final 15 min. Add ½ oz Amarillo at final 1 min. Cool wort in sink (cold water and ice). At ~120 'F, strain wort, and add to 2 gal cold water in fermentor. Top off to 5 gal with cold water. Pitch yeast. Pitched yeast 4.5 hrs after activation. Steeping the grains. I realize it looks like I'm boiling a sock. (Before adding yeast) Beer a hazy deep marigold color; strong hop scent; tastes bitter with a dry citrus hop flavor. Expect this beer to be strong and hoppy. Not sure how much sweetness will be there after bottling. I was hoping for something like a cross between the strength of an IPA and the body and flavor of an APA. However, I sort of rushed the final planning. Therefore, I'm not sure what to expect. 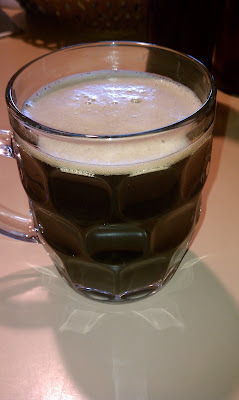 The light malt extract syrup and Munich malt seem to have given the beer a lighter hue and drier flavor. I'm concerned I should have gotten a crystal malt for sweetness. Just have to wait and see now. Hop pellets. Not cool enough for the raw flowers (yet). Fermentor with yeast added. Now we play the waiting game. Love the swirl the yeast makes. 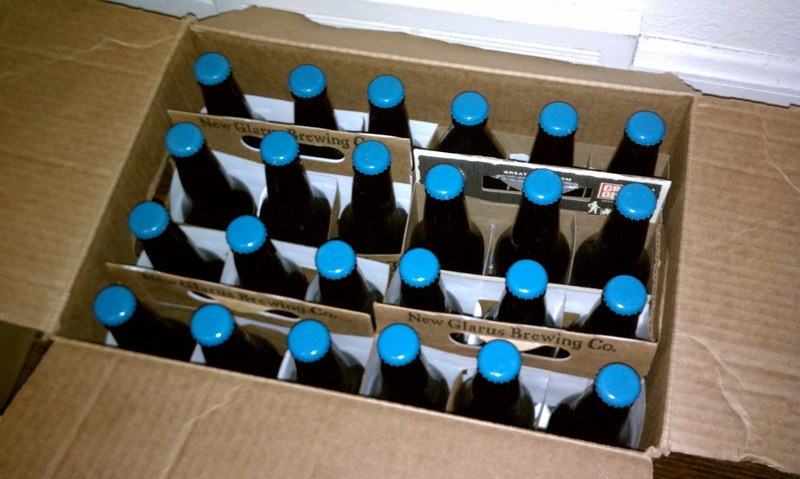 10/21 - Bottling: Racked beer into second fermentor, added 1 1/4 c dried malt extract boiled in 16 oz water for 5 mins. Gravity at 1.022 upon bottling. Taste: Coffee, bitter chocolate, more like a stout than a brown ale. Very excited about this beer from first taste! 11/1 - First beer: Deep amber/brown color. Slight smell of yeast. Nice carbonation. More like a stout or light porter than a brown ale. Dry taste. Coffee, smoke, (very) slight sweetness. Sediment and yeast seems to have settled well. Overall impression: Very Good! I would buy this beer at a bar, maybe even more than one. 11/13 - Beer has filled in. Nice hint of sweetness (dark chocolate-like) before dry bitter flavor at end. Jenny loves it! Have decided to call it "Poutin' Stout" in her honor. 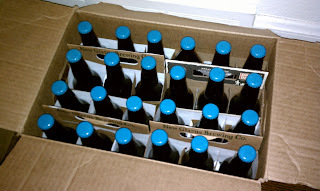 Since this blog is coming a few months after my first and second batches of beer, I'd better get you up-to-date. Here's an account of my first foray into brewing beer! Bring 6 qrts of water to a boil. Add malt extract and 1 oz Willamette hops. Boil 30 mins. Add 1/2 oz Kent Goldings hops and boil 8 mins. 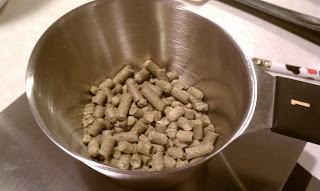 Add 1/2 oz Kent Goldings hops and boil 2 mins. Remove wort from heat. Place pot in sink containing cold water and ice. Let cool ~15 mins. Add to 3 3/4 gal cold water in fermentor carboy. Top off with cold water to 5 1/4 gal. Pitched yeast at just below 80 'F. Specific gravity: 1.038. Basement temp: 74 'F, 63% humidity. 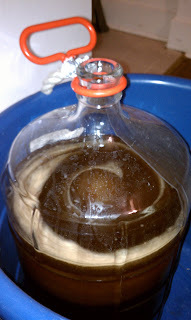 7/30 - Fermentor overflowed, replaced fermentation lock. (Lesson: Consider using blow-off hose for next batch?) Basement temp: 72 'F, 62% humidity. 7/31 - CO2 bubbling ~44 sec. 8/18 - Priming sugar: Boiled 3/4 c corn sugar in 4 oz water. Added to second-stage carboy. 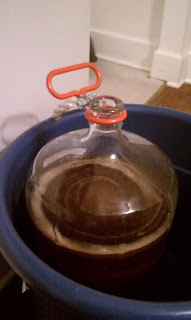 Racked beer from from fermentor into carboy. Bottled immediately. Two things I'd never done, but always wanted to do: brew beer AND start a blog. After a few years of wanting to try my hand at homebrewing, I finally pulled the trigger this past June: I bought a kit and immediately dived in. So far, the experience has been intoxicating. (Don't worry, I already hate myself for the pun.) After two batches, I'm now planning my third. 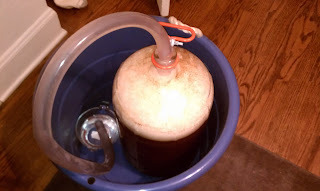 Then, in the process of jotting down ingredients and formulating a recipe, it hit me: Why not start a blog about homebrewing?! Posting online would be an easy (and fun?) way to track my progress and store what I've learned. 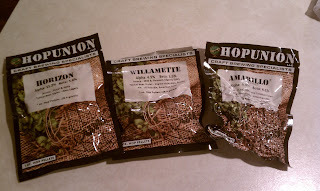 So here I am; brewing beer and blog. I'll post my experience: Recipes, tips, and more; and hopefully have some fun along the way.